Katy Republican Bill Callegari said Monday he won't seek another term in the Texas House, bringing to 12 the number of state representatives who won't be up for re-election in 2014. State Rep. Bill Callegari, a Katy Republican who chairs the House Committee on Pensions and the House Research Organization, said Monday that he wouldn't seek another term in 2014. Callegari, an engineer, took his seat in the House in 2001. He's the 12th member of the Texas House to say he won't be back. Several are running for other offices, while others are getting out of politics for now. Republican Reps. Dan Branch of Dallas, Stefani Carter of Dallas, Brandon Creighton of Conroe, Harvey Hilderbran of Kerrville and Van Taylor of Plano are all seeking other offices. Callegari is joining a group that won't be on the ballot next year that also includes John Davis, R-Houston; Craig Eiland, D-Galveston; Tryon Lewis, R-Odessa; Rob Orr, R-Burleson; Jim Pitts, R-Waxahachie; and Mark Strama, D-Austin. Strama already resigned from the Legislature to take a private sector job. The special election to replace him is on this November's ballot. Today, State Representative William A. 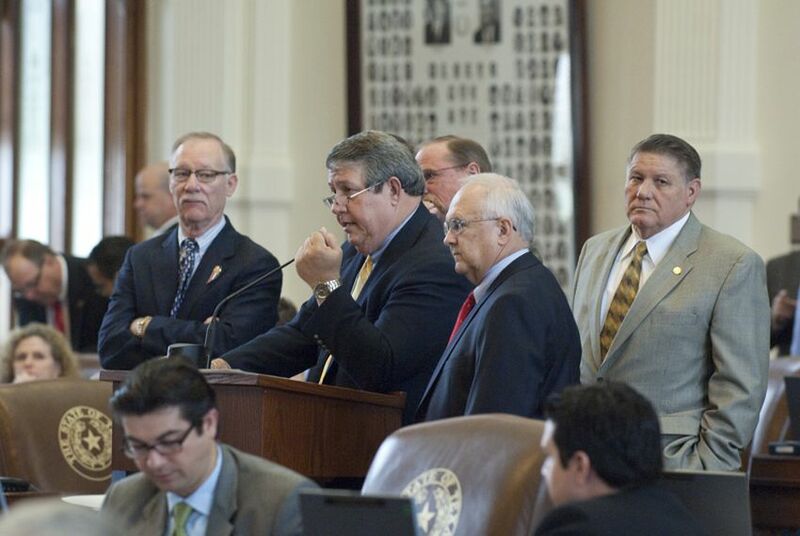 “Bill” Callegari announced that he will retire from the Texas House of Representatives when his current term expires in January, 2015. Callegari, the Chairman of the House Committee on Pensions, Chairman of the House Research Organization, and senior member of the Natural Resources Committee, said that he will not seek reelection to the District 132 Texas House seat to which he was first elected in 2000. Callegari, a Republican, is currently serving his seventh term in the Texas Legislature representing the Harris County communities of Katy and Cypress. “I have contemplated my retirement as the current legislative session came to an end and decided to make the announcement today, on my 72nd birthday,” Callegari said. “Serving in the Texas House of Representatives has been one of the greatest honors of my life and I want to thank the voters of my district for allowing me to serve them for these many years and to be their voice in our state’s capitol,” Callegari said. “I have enjoyed my service immensely and I am proud of the work that we have accomplished together during the past thirteen years on behalf of District 132, Harris County, and the State of Texas,” he added. Although he believes that he still has much to contribute, Callegari said that he will look for opportunities other than those provided in the Texas House to serve his district and state. “Our state’s founders believed in the concept of a citizen’s legislature where men and women would go to Austin, serve the citizens of Texas as their elected Representatives, and then come back home to live and work under the laws they helped pass,” said Representative Callegari. “With the support of my constituents, I have worked hard to honorably serve Texas and to be a strong voice for the people of District 132. The time has now come for me to come back home and contribute to my state and my community in other ways,” he added. “When I first ran for the Texas House and in every subsequent campaign for reelection I focused on the importance of families to the strength of Texas,” said Callegari. “Throughout my legislative career I have worked hard to keep families strong and unburdened by the actions of state government; however, I could never have accomplished the things that I did in the Texas Legislature and throughout my life without the love and support of my wife of fifty years, Ann, our four children, their spouses, and our eleven grandchildren. They have sacrificed much in order for me to serve and it is now time to for me to thank them for all they have done by spending some well-deserved quality time with them together as a family,” Callegari added. Among his many legislative successes, he authored water resources management legislation, measures to reform the business franchise tax, created the Texas Hurricane Center for Innovative Technology, implemented disaster preparedness requirements for water utilities, protected private property rights by passing the groundbreaking Landowner ́s Bill of Rights Act and CCN reform. As a two-term Chairman of the Government Efficiency and Reform Committee, he passed legislation eliminating obsolete state agencies, and improved government efficiency by reducing burdensome regulations and eliminating unneeded licensing laws. He reformed the community college district annexation process, directed Sunset legislation affecting Texas ́ affordable housing program, modernized civil contracting resulting in millions of dollars saved by Texas taxpayers, and amended the Texas Constitution allowing water districts to create parks and recreational facilities. Most recently, he passed sweeping pension reform legislation that will help keep the state’s pension plans solvent and able to honor the commitments made to state employees, and especially to our retired teachers. Callegari is a proud, life-long Republican, and is a strong, fiscally conservative, pro-business leader in the Texas legislature. He has been recognized by countless organizations for his integrity, his work ethic, and his common-sense leadership in the Texas House. He has worked tirelessly to build and strengthen the Republican Party in Texas, and was a leader in the efforts for his party to become the majority party in the Texas House of Representatives in 2002. He is a member and has been an officer in the House Republican Caucus, is a Board Member of the Texas Conservative Coalition, and is a member of the Texas Legislature’s Tea Party Caucus. During his legislative Career, Callegari has been recognized as pro-life leader and he authored or co-authored numerous pieces of pro-life legislation in the Texas House, including the landmark sonogram bill passed in 2011. He has been honored for his efforts in defense of the sanctity of human life by numerous pro-life, pro-family organizations. Callegari graduated with a Bachelor of Science Degree in Agricultural Engineering from Louisiana State University in 1963 and a Master of Science Degree in Civil Engineering from the University of Houston in 1972. In 1974, Callegari founded AM-TEX Corporation, which provided management and privatization services to utility districts and municipalities throughout Texas. As President and CEO, he pioneered AM-TEX ́s growth as a major force in the state and national water industry. Subsequent to selling AM-TEX, he served as President of several major national and international water companies. During his professional career Mr. Callegari founded the Texas Association of Water Board Directors and served on several professional committees and boards relating to environmental control, water, and wastewater treatment. He has been a Licensed Professional Engineer for over 40 years and holds "Class A" certifications in water and wastewater management. He is recognized by many as the state’s leading water expert in the Texas Legislature. Representative Callegari has been honored as a member of both the LSU and the University of Houston College of Engineering Halls of Distinction, as well as the LSU Alumni Hall of Distinction and the LSU Alumni Center Wall of Honor. His legacy at LSU will be forever recognized thanks to the William A. Callegari Environmental Center named in his honor. In addition, Mr. Callegari was recently inducted as a Fellow in the Texas Engineering Foundation. Before being elected to the Texas Legislature, Callegari was a member of the Board of Trustees of the Katy Independent School District. He also served as a Board Member of the Katy Chamber of Commerce and various other organizations, and was a two-time President of the Katy High School Booster Club. “My service in the Texas House of Representatives has been a greatly rewarding experience and one that I will never forget,” Callegari said. “Now it is time to watch a new generation of leaders serve their state in the Legislature. I wish them Godspeed as they fight to ensure that Texas remains the greatest state in the greatest nation on the face of the earth,” Callegari concluded.